Need Blinds, Shades or Shutters? Blinds, Shades & Shutters can be decorative, functional and energy saving. 25% off Retail pricing to my clients! As a professional Interior Designer, I can help you asses your needs and find a style of window coverings that will fit your style and function well for many years to come. Protection: Window coverings provide protection from heat and UV rays. (Hello Texas Summer!) Whether you choose shutters, shades, blinds, they will protect your home from the heat of the sun window and prevent damage to your home and furnishings. Light control: Controlling the amount of light in a space can be very important. You may need blackout shades in the bedroom or media room, or varying light for the kitchen or bathroom. Privacy: Neighbors too close? Windows in your office? 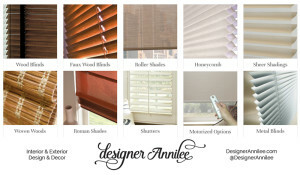 Window treatments provide needed privacy with a variety of options. Energy saving: Did you know window treatments can help insulate your home? By keeping heat out in the summer, and in in the winter you can lower your energy bills. Aesthetics: Window treatments enhance the overall visual appeal of your space. There are many different varieties that will suit modern decor and traditional settings.